It is engagingly performed by a dedicated cast under the carefully controlled direction of Michael James Burgess that builds in intensity as it speeds towards the climax. 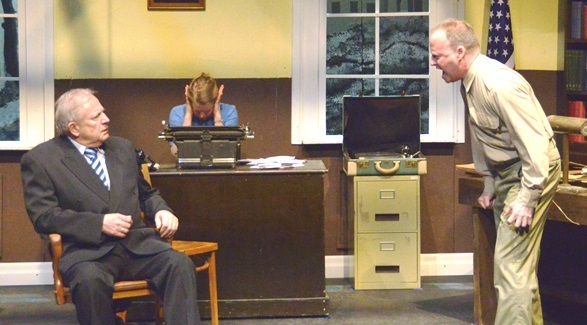 This powerful play by Ronald Harwood takes place in Germany just after the Second World War. Major Steve Arnold interrogates the famous conductor Wilhelm Furtwangler about his supposed involvement with the Nazi party. Harwood neatly sets up Major Arnold’s antipathy towards the famed conductor… antipathy that often boils over into rage. Tony Rein gives a dazzling performance of frightening intensity as he bullies Alan Washbrook who plays the aging conductor with passion and dignity. Washbrook delivers Furtwangler’s ardent defense claiming that music can and should be a unifying force in the world; beyond politics, beyond boarders. In an effort to counter the major’s sometimes vicious attacks, Holm Bradwell in the role of a young Lieutenant- David Wills often finds himself defending the conductor, further infuriating the Major. Hanna Peltoniemi-Fam portrays Emmi Straube -the secretary charged with transcribing the interrogation, who is mortified by the condescending way Arnold treats Furtwangler. She pleads with him in vain to show some respect. The Major frequently refers to the conductor as a “bandleader” and ignores her. Robert Glen appears as Helmuth Rode, a former second violinist who provides the Major with information about Furtwangler’s professional rivalries and womanizing. Molly Lubell makes the most of her brief appearance early on in the play as Tamara Sachs. It’s a small cast in a small office which lends a claustrophobic feel to the cross-examination. Karen Edgley created the sets and Cynthia Pereira provides the severe lighting. There are warning signs in the lobby advising of strong language in the play, though as the director observes in his program notes it is “no worse than one hears constantly on the streets of Toronto nowadays.” The language, mostly spewed by the American Major quickly establishes his intimidating character. Don’t be put off by it. It’s part of the fabric of fascinating play that will leave you with much to think about afterwards. And you too will marvel at the professionalism of both the cast and the production. Stage Centre Productions presents Taking Sides at York Woods Library Theatre, 1785 Finch avenue West, until Saturday March 16. For tickets visit the website or call 416-299-5557.